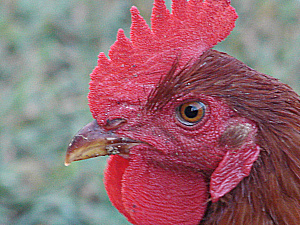 My Rhode Island Red Rooster: I am Faysel from Pakistan. 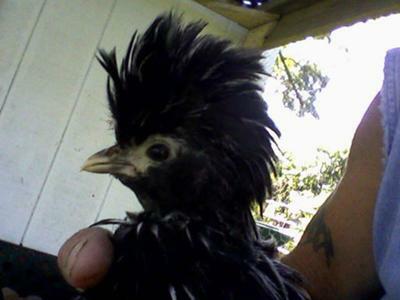 I own almost all the exotic rare chicken breeds. 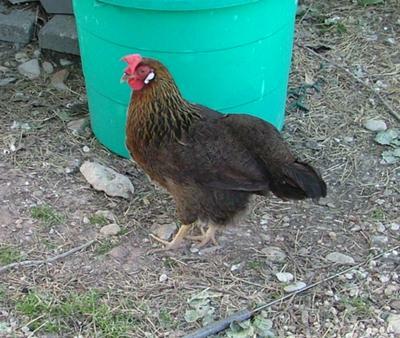 Here I am showing you my beautiful Rhode Island Red Rooster. 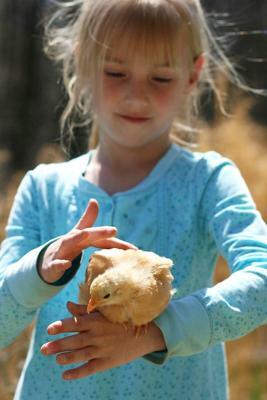 Fun Raising My Own Chickens: Two years ago I ordered 5 baby Rhode Island Red chicks and have had them for 2 years. 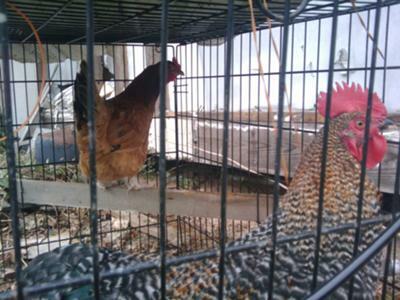 They have laid plenty eggs that I had to sell some to people so the eggs would not go bad. In the mean time my red hen decided to start sitting a clutch of eggs and hatched a couple of young roosters. 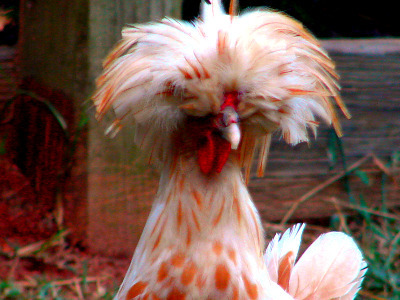 They grew up to be very nice looking roosters but had to trade them for a good laying hen. My main rooster started to fight with them. 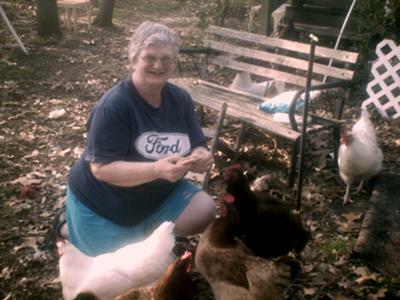 When I was a small child my grandmother had plenty chickens around the farm and she enjoyed her chickens just like I do. 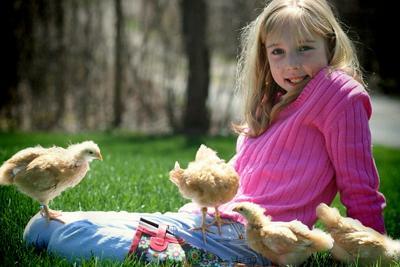 Guess being around grandma's chickens and watching how she raised hers I learned how to care for them. I enjoy collecting eggs every day and always have eggs for breakfast and for baking. There isn't a day when I need an egg for any reason for my own use. I will keep my chickens until it's my time to go to heaven. 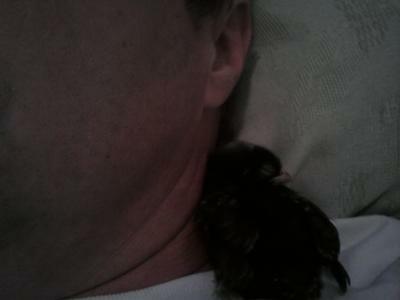 This is Ebba she went broody a about 1 month ago. I tried to separate her from the other hens but she wasn't having that. 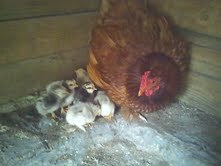 She is hatching a very odd flock with chicks that vary in age by one week, so far. Since we have a combo of barred rocks, rhode island reds, ISA browns, buff orpingtons and silver wyandotte hens and an ISA rooster plus one buff orpington roo, we don't know whose egg will hatch next. She wouldn't leave the favorite nest so I gave up trying to control the eggs that were going in there. 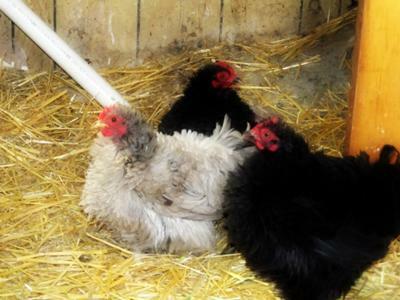 It was too much of a fight and she was really frantic when I tried to follow instructions on moving a broody hen. They're sneaky those chickens! We lost some eggs to breakage but she's still sitting on about 6. So far she's hatched 2 buff colored, I'm not sure one may be an ISA, and two I'm pretty sure they're barred rocks. The question is "Who's the Daddy?" Sweet little babies. I love them all. The Man of the COOP: He is our newest addition and we are having the hardest time coming up with the perfect name for him! He is the most awesome roo I could have ever asked for!!! 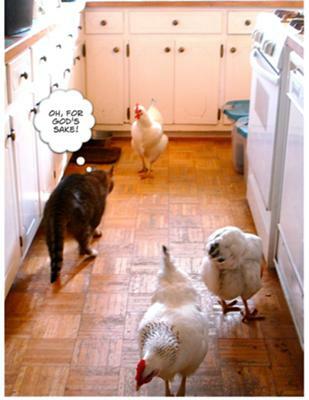 Chickens in the Kitchen: Well don't know how they found their way into the kitchen but they did. Boy did that surprise the cat. Will They Find Their Roost? Will They Find Their Roost? If my chickens have spent there whole life in confinement in a coop. Will they come back to the coop to roost if I let them out? 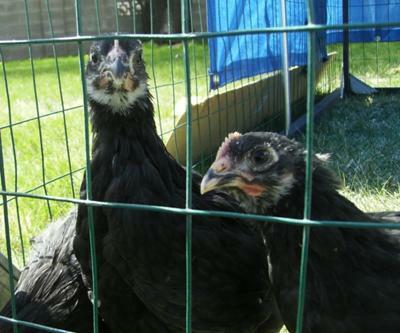 Will they find their way back and how old should they be when you let them out of their coop fence to roam around? Yes, but start slowly. I would begin to let them out only when I could observe them and then slowly work up to them free ranging all day. If the chicks are fully feathered they should be alright to roam. Most of the time their mothers will teach them as they go. 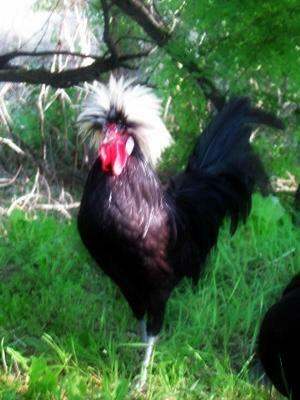 Rudy, Bantam Cochin Roooster: We All Love ROCK'IN RUDY!! He thinks he is the hottest dude around!! 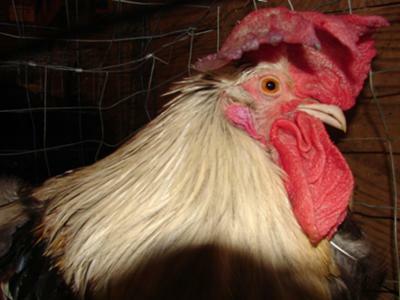 Juicy FatHead the Rooster: When our first flock of chickens were pullets, our neighbor gave us a rooster and a hen. 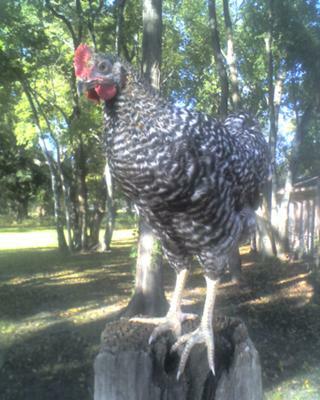 This rooster has 'raised' our chickens and is a real hoot. The neighbors child named the rooster, Juicy Fathead. Juicy went on to fight a goshawk out of our coop in protection of his girls. If any hens are missing at night, he walks around the yard squawking until he finds them and brings them to bed. Well, he is a real character. 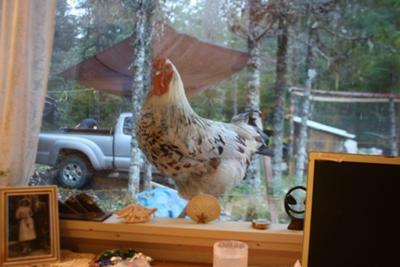 And during the day I work at my desk and the chickens occasionally peek in the glass door or through the window from outside. This wasn't enough for Juicy, as he had to get a closer look. He flew onto the window sill and stared right at me for a while. Long enough, that I was able to grab my camera. 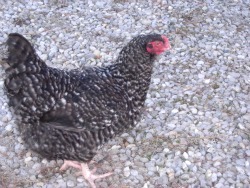 Smokey is a cross between a Barred-Rock and Rhode Island Red. He's a lot of fun and at times a tad injurious as he is a rooster and will peck, but I think it's because he enjoys rough-housing. I hatched him in early August '10 and took these pictures as he grew. I fed him oatmeal at the start cause it's all I had (my ex called the police and I had to move from my farm Smokey being the only animal I could keep and BARELY did keep him) and have grown him to this point on a single bag of Neutrena Naturewise Premium. All in a days work. I have a bared rock that I raised from a chick. he is so tame I take him to work on my day off. I work in a nursing home and they just love to see me come in with him. His name is Big Bad Bruce. but he will sit on your lap for hours and fall asleep or just look around. 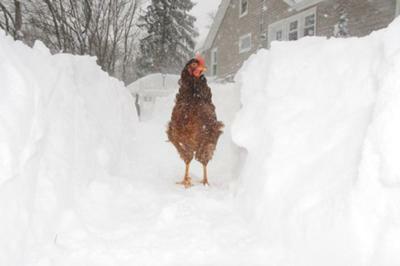 Cochin Hero Story: During the winter, it was cold but they'd been cooped up for so long I opened their door. About half accepted the invitation. I went out when it was dark to close their door to keep out drafts and saw one of favorite Black Cochin hens dead in the snow. I quickly picked her up and she was warm and still soft. I looked at the Rooster near her and he was covered in blood. On the post sat an evil looking hawk. In an instant I understood that the rooster had tried to save her. Like a mad woman I ran at the hawk screaming and flapping my arms. I was so touched at his bravery. I patted him, tried to let him know I knew. They are more smart than many people think. 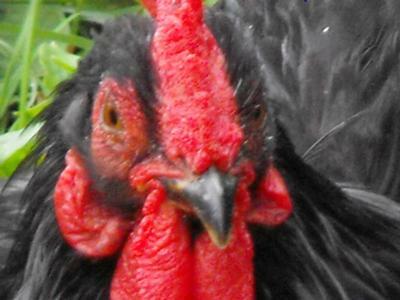 I think that is one of the most heart warming stories about chickens that I have heard. Was the rooster okay? Yes he was fine. But this is almost creepy ... a hawk got him today. He's gone. I don't understand. This is a Red Tail Hawk not much bigger than he is. We live on a lavender farm and in a month we will be open for lavender harvest which means a lot of people around, so the hawk won't come down. I think I will have to pen them until then. But I'm torn ... they so enjoy running up and down the lanes and the field, I hate to do it. Plus I think the hens like being able to get away from the guys sometimes and in the run, they'd have way less space. I know hawks have to eat too ... just not my friends!! NOOOOO! This is so sad! After all he went through to save the hen. I completely understand what you are saying though. We have the same situation because we live on a farm and there are lots of hawks in the area. My little guys love to be out just wandering around having a good time. At some point I believe it is quality vs quantity of life. I am so sorry he's gone though. I know he will be dearly missed. I think that is one of the most heart warming stories about chickens that I have heard. Was the rooster okay? Thank goodness for roosters! 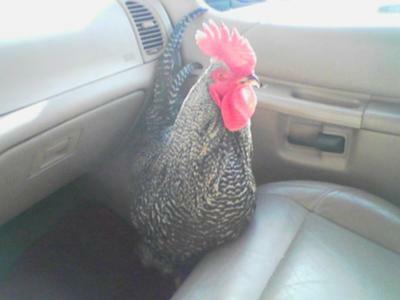 Thank you so much for sharing that wonderful story of bravery about your rooster. I was born in Los Angeles, a country girl, totally out of her element, but I made it to the country and that's how I like it. 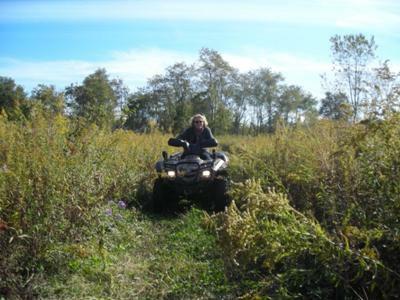 I fell in love with Oregon when a girlfriend and her family bought 160 acres and took me with them to help them move. I visited every summer through high school. I always made it my job to do the summer clean out of the chicken house. 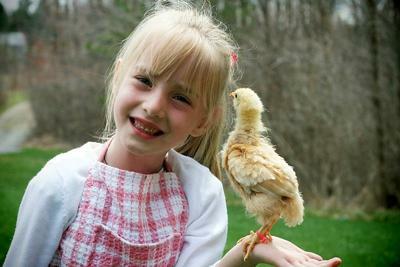 My love for chickens and all animals has grown exponentially since childhood. In Oregon I had the bird rescue, chickens - of course, raised Siamese cats, Angora rabbits & goats, pigeons, doves, cockatiels, and several different primative breeds of sheep. I worked as a vet tech in Los Angeles and in Oregon, but moved on to in-home care for people. I think I've had a pretty well rounded life and consider myself semi-retired. Betty shaking her tail feather in the snow: This was Betty's first winter. She didn't want to come out of the barn, but I wanted her to stretch her legs, and walk down the path. Bertha, Frankie and Stella: These Frizzles are my babies, not much else to say about them but they are just too cute! And they lay small pink eggs, just adorable!!! Q-Tip: This is walking yard art. You can't imagine how much fun and laughter these birds bring. Just for the fun of it, get a couple of these and add them to your yard. 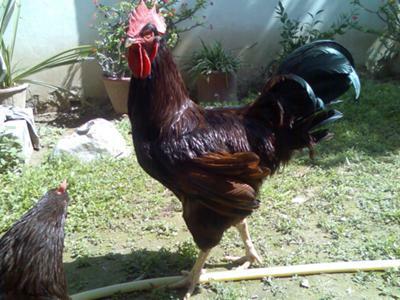 This is my rooster Big Red. He keeps everybody in order. Aussies are excellent small flock or backyard chickens. 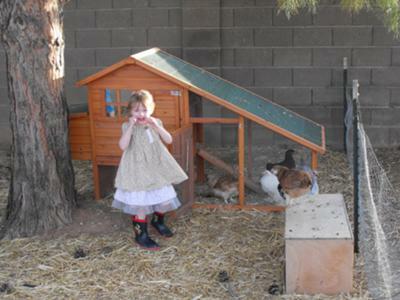 I keep 6-8 in a suburban environment and few of my neighbors even know that I have chickens. Of course, I only keep hens. They're hardy and cold tolerant, yet do OK in the heat. That's why they are ideal here in Utah, just as in Australia. I think they are decorative, being heavily feathered with the iridescent green showing, but I wouldn't keep them just for that. Fortunately, they're also good egg layers. 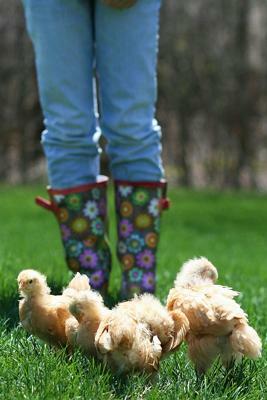 Buff Orpington Beauties: We just purchased our day old Buff Orpington's the beginning of April. It's our family's first time raising chickens and we are hooked! 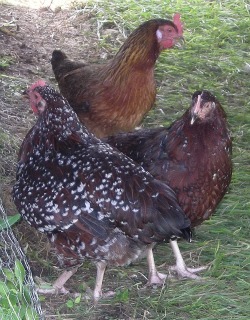 Our girls are Dixie, Daisy, Jasmine and Lilly. They are so sweet and loving. They adore my children and vice-versa. Here are a few pictures of them. I hope you enjoy! Smokin Chicken: This is a funny photo I ran across that I wanted to share with everyone. I didn't do this, but I think I got this photo from someone in weapons platoon. 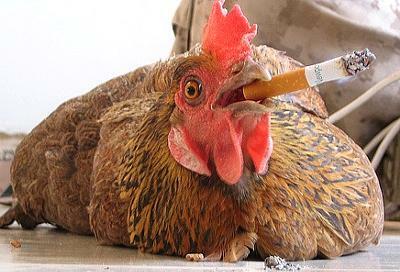 This is pretty much what a bunch of bored Marines will do, give a chicken 1 last smoke. By the way, he likes Newports. And yes, the chicken is still alive and I can't wait to read the comments people will leave. This is Sargent Carter our pride and joy. He is our head security guard. The Sargent has been with us for five years. I cannot tell you what a joy it is raising chickens, if you are on the fence, jump off and go get some. They are more fun than most of my friends, and they don't talk back, except when they are hungry. 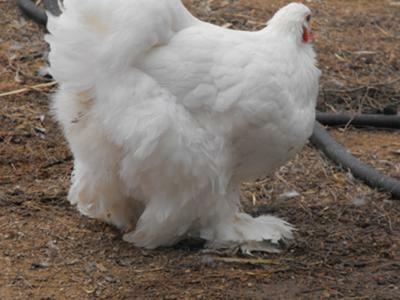 Two Bantams Sharing a Family: Two bantam hens laid on 16 eggs together. Nine of them hatched and they let the others die. I opened up the eggs. Three were formed and two were not formed. I have discovered that chickens take good care of there babies however, it takes a long time for new ones to hatch and when they finally do they look deformed compare to the older chicks. So the chicks want to peck them dead. So two of these chicks I had to bring in my house to raise with the other bantam chicks I purchased from McMurray Hatchery. This is Miss Dizzy. Sometimes I call her "Dizzy Who", but mostly we just call her "Diz." Miss Diz is blind in one eye. She has a cat and it is getting worse. Diz loves dog food and comes up on the deck every evening at 5:00 and goes into the house, talking away at the dog food pail. She and our little Boston terrier mix-mut share the bowl and sometimes lay in front of the door, begging for food (side by side). The reason her name is Dizzy is because she cannot keep her balance and frequently falls and runs into things. If we had not brought her home, she would have died because she couldn't eat on her own and couldn't "focus" on a target as large as a bowl. She was brought up on milky bread and baby mash. She is working on 2 years of age now and is so darn sweet. Everyone that comes up just has to hold her! She wins everyone over with her one good eye (she has learned to flop her comb over to see) and her sweet baby clucks she can still make!